These delicate glass Christmas ornaments are hand crafted using traditional techniques that are hundreds of years old. Each ornament is formed by blowing molten glass into finely carved molds in an age-old tradition. Once cooled, the decoration is hand painted and glittered, forming a beautiful and unique creation. You will be impressed by the fine workmanship that each ornament displays. The ornaments are carefully wrapped and come in a kraft paper box for gift giving. These delightful and detailed holiday ornaments are one of a kind and will truly stand out on your Christmas tree. CHRISTMAS TRADITIONS: These delicate Christmas ornaments are hand crafted using traditional techniques that are hundreds of years old. 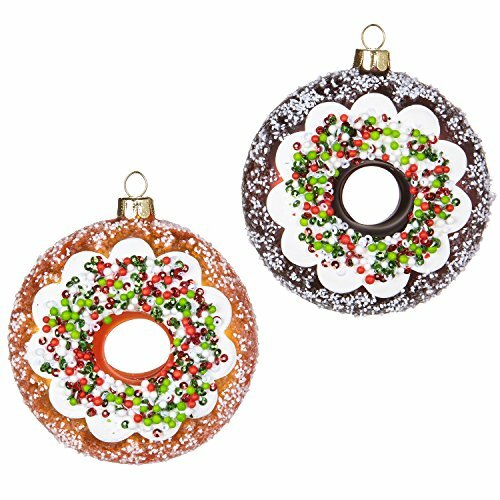 You’ll be delighted by the playfulness of each adorable, sparkly, beaded glass donut ornament. ARTISAN MADE: Each ornament is formed by blowing molten glass into finely carved molds in an age-old tradition. Once cooled, the decoration is hand painted and glittered, forming a beautiful and unique creation. You will be impressed by the fine workmanship that this ornament displays. GIFT BOX PRESENTATION: The ornaments are carefully wrapped and come in a kraft paper box for gifting or safe storage. TRIM THE TREE: The delightful and detailed holiday ornaments are one of a kind and will truly stand out on your Christmas Tree. NEW FOR CHRISTMAS 2018: This brand new release is part of the 2018 “Santa’s Diner” Christmas Holiday Collection from RAZ Imports.